I've been watching Pawn Stars religiously since the summer of 2009 when it started. I even made my wife visit their store with me when we went to Las Vegas that next summer. 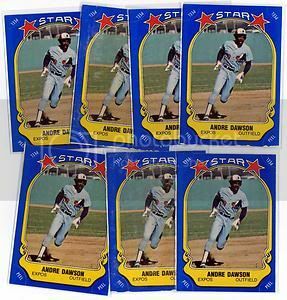 The other day I came across a 1981 Fleer Star Stickers Andre Dawson card. 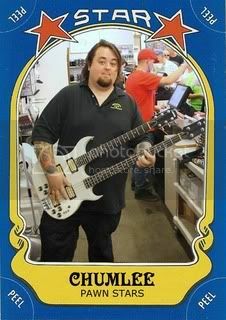 I thought the design would make for a nice custom Pawn Stars baseball card. I chose to use Las Vegas's most eligible bachelor, Chumlee! The card is pretty much like the originals except I went with a more psychedelic font for Chum's name. 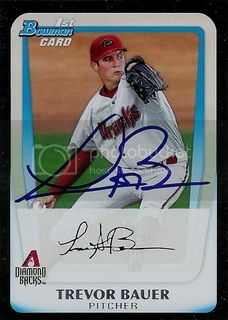 We were able to get Trevor Bauer's autograph back in Spring Training. Arguably being the D-Backs top prospect, he already had plenty of buzz around him. The good news for us is that on the day we saw him, he signed autographs for everyone who asked. I had him sign his 2011 Bowman rookie card. Since then Trevor made his MLB debut in June, struggled mightily over a few starts, and was sent back down to Triple A. He's still our top prospect but some have cooled off on him a bit. His name is even out there in trade rumors this off-season. Hopefully he comes into Spring Training next year and solidifies his spot in the D-Backs rotation. Maybe I'll even be able to get another autograph from him. The stack of D-Backs that Dennis from Too Many Verlanders sent us back in August inspired me to send off a few TTM autograph requests. I sent this 1998 UD Collector's Choice to Willie Blair c/o the Fort Wayne TinCaps before their season ended. It came back signed a few weeks later. 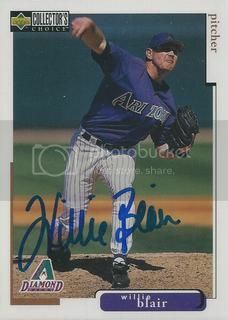 Willie was one of the Diamondbacks starting pitchers back in 1998, their inaugural year. He lost 15 games while he was with Arizona. 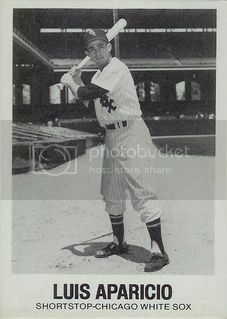 He would go on to lose one more game that year for the Mets. He was acquired by New York at the trade deadline in exchange for Bernard Gilkey. Back when 2012 Gypsy Queen came out, I picked up this Trevor Cahill autograph. 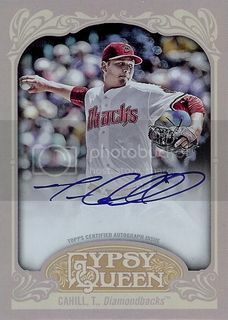 I've gotten Trevor's autograph on an A's card before but this is his first certified auto to feature him on the D-Backs. I've never actually owned a TCMA card until I got this one. 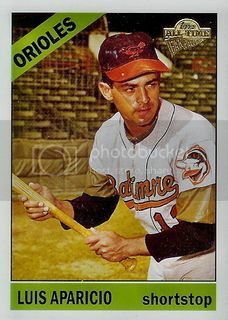 This Luis Aparicio card is part of their 1977 set. It's a simple design that reminds me a lot of the 1960 Leaf set. I've always liked the autographed relic cards from the 2003 Playoff Piece of the Game set. They were some of the first reasonably priced auto/relic cards to hit the market. I picked up this Matt Williams one and a few others back in 2003. Matt is currently the Diamondbacks third base coach. However his name was out there for both the Rockies and the Blue Jays managerial openings. I wouldn't be surprised to see him elsewhere soon. 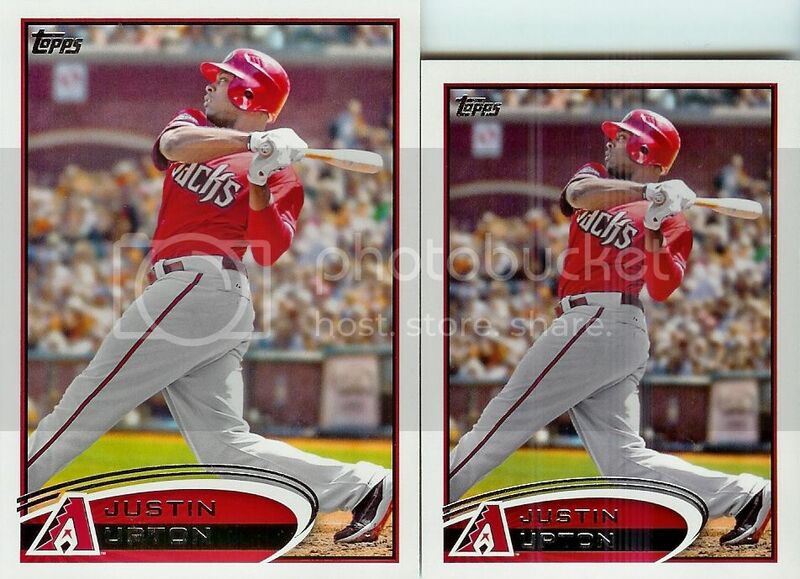 I've slowly been picking up some Diamondbacks cards in anticipation of getting autographs during Spring Training next year. 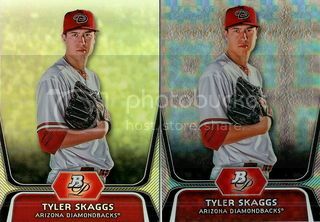 These two Tyler Skaggs cards are from the 2012 Bowman Platinum set. The X-Fractor on the right is pretty cool. Brian from 30-Year Old Cardboard sent us this card for our Luis Aparicio collection. It's from the 2004 Fleer Greats of the Game set. I know Topps has done a good job of integrating all-time greats in their various sets but I miss the Fleer Greats of the Game sets that were exclusively for retired players. Happy Veteran's Day! 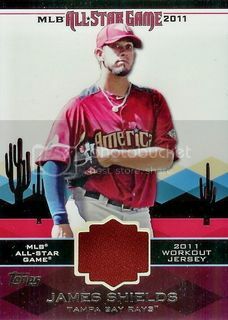 Today we picked up another 2011 Topps Update All-Star Jersey card. This one is of Tampa Bay Rays pitcher, James Shields. This is our 32nd from the set. I finally got my first mini 2012 Topps card. It's of Justin Upton. The Upton trade rumors are back. I won't be surprised if they move him this time. I won't be too sad to see him go as long as the D-Backs get something good in return. 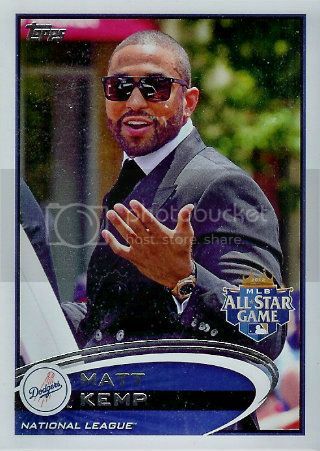 I pulled this Matt Kemp All-Star SP card out a pack of 2012 Topps Update. If you need it, send me an email. Not looking for much in return. Maybe a few of your extra D-Backs. Thanks! I pulled this C.C. 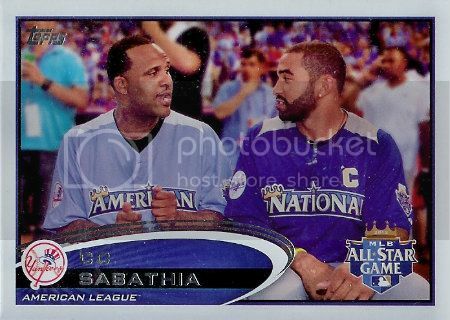 Sabathia All-Star SP card out a pack of 2012 Topps Update. If you need it, send me an email. Not looking for much in return. Maybe a few of your extra D-Backs. Thanks! 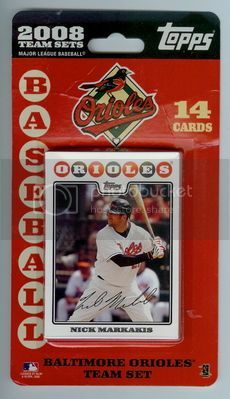 I picked up this Baltimore Orioles 14-card team set off eBay awhile ago. When the package arrived, I opened it and put the set in one of the cabinets in our kitchen. I do that occasionally instead of putting something away right away. This one has hung out in our kitchen for months but it's finally been scanned and is ready to make it's debut on our blog. 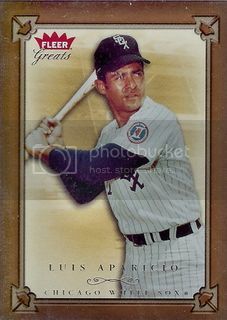 Brian from 30-Year Old Cardboard sent us this card for our Luis Aparicio collection. 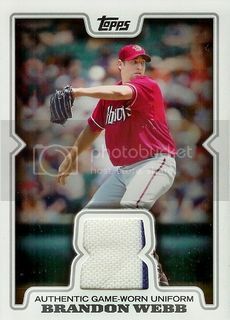 It's from the 2004 Topps Fan Favorites set. I really like this updated version of his 1966 card. Thanks, Brian. It's about time that I picked this card up. You can't have a player collection without having that player's Topps rookie card. 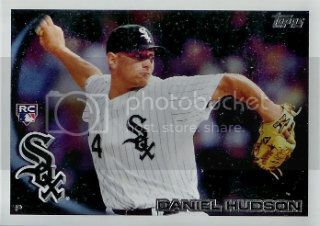 This one is from 2010 Topps Series One which came out before Daniel was traded to the Diamondbacks. Alfredo aka The Cardboard Don sent us this Brandon Webb jersey card in a trade a few weeks ago. I've been wanting this one for awhile but never pulled the trigger. I guess Alfredo's getting out of the card game. According to his blog post yesterday he has begun selling somethings on eBay. Check out his auctions, there's some great stuff up there already. 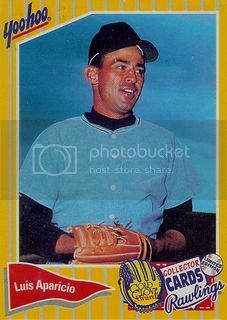 I picked up a lot of a dozen Luis Aparicio cards off eBay. I had most of them but I had never even seen this Yoohoo card. It's from a 20 card set that was produced in 1994. The checklist features 16 All-Time Greats and four fact cards.